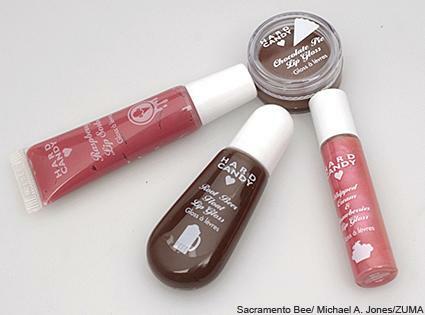 Hard Candy cosmetics are fresh and trendy. Geared towards teenagers (and the young-at-heart), Hard Candy offers a vibrant array of sparkling, rainbow colored products for girls and women who like to have fun with their makeup. Hard Candy's packaging is as glittery and colorful as their products. It's easy to see why they attract young consumers -- their makeup is bright and flirty with catchy names to match. They're all about a little bit of flash and fun to liven up your look. Hard Candy's vibrantly colored products and adorable heart logo are bound to grab attention. Hard Candy products are primarily available at Wal-Mart and online. Walmart: Shop the full line of Hard Candy products at your local Wal-Mart or on their site. Amazon: Hundreds of Hard Candy cosmetics are available on Amazon. Look for retailers that offer free shipping. Ebay: Ebay is a great place to find deals and your favorite discontinued products. Make sure you only buy from reliable sellers. Sheer Envy Primer: This lightweight formula can be worn alone or under makeup. Use the primer to even out skin tone, the perfecting primer to hide fine lines and smooth skin, and the illuminating primer to get a healthy, natural glow. Nobody's Perfect Concealer Palette: With six easy-to-blend shades, you are guaranteed a perfect match. Use it to cover dark spots, redness, and even out skin tone. Fox in a Box Bronzing Duos & Blushing Quads: Available in five color combinations, these bronzers and blushes mix together flawlessly for a natural, flushed look. Ginormous Lash Volumizing Mascara: Get fuller, longer lashes in traditional black or brown; or go for something different and try one of the bright purple and blue shades. Kal-eye-descope Baked Eyeshadow Duo: These popular eyeshadow duos can be used wet or dry as liner or shadow. Glitterazi Eye Glitter Gel: This is fool-proof giltter at its best. Easy to apply gel filled with oen of four shades of glitter allows you to layer alone or over eyeshadow to achieve the sparkle-factor you're after. Plumping Serum Fat Pout Lip Gloss: Fat Pout promises to provide sheer, shimmery color and make lips fuller with Hard Candy's plumping serum. Glossaholic Sequin Shine Saturated Lip Gloss: Infused with reflective pearlized prisms, this gloss makes lips sparkle and appear bigger. Show Girl All Over Body Glitter: Great for a night out, body glitter is a fun, unexpected way to add some sparkle to your look. Glow All the Way Skin Lumizer: Available in two shades, this shimmering cream will give your body (and face) a radiant all-over glow. Just Nails Nail Polish with Ring is the original, and still favorite Hard Candy product. Just Nails is available in a broad spectrum of bright, trendy hues. They come with a matching ring to rock with your manicure. Hard Candy was founded in by Dineh Mohajer in 1995. She was having difficulty finding nail polish to match her shoes, so she decided to make her own. Hard Candy was born. Dineh created a set of four pastel nail polishes -- sky, sunshine, mint, and violet -- that would become iconic of the brand. The polishes were an instant hit in the trendy Los Angeles boutiques that carried them. When Clueless star, Alicia Silverstone, mentioned her Hard Candy manicure on the David Letterman Show, the brand became an overnight international sensation. The company has since expanded to include a full line of cosmetics for eyes, lips, face, and body; but their nail polish, with trademark matching ring, is still their most famous product. In 2009, Hard Candy partnered with Wal-Mart to re-launch the brand with the goal of making top-quality products, previously relegated to the specialty market, available to everyone. Hard Candy's fun, flirty cosmetics are now sold at Wal-Mart stores nationwide for affordable prices.